I often think I see eyes, faces and sometimes other body parts in the trees, but I've never seen such a clear face as the one in this picture taken by Joolz Darling. 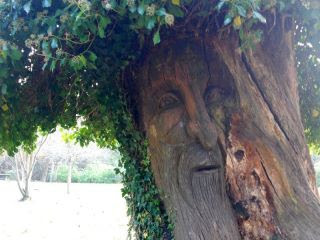 Joolz said: "Thought I'd share this tree pic took in out my local park in Swansea - Clyne Gardens." Thanks very much indeed, Joolz, for letting me post your fascinating photo on my blog!